The 1ST MYCOKEY INTERNATIONAL CONFERENCE (Europe) was organized in collaboration with the other EU H2020 project Mytoolbox. 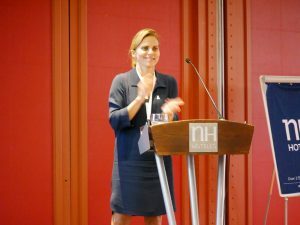 The title of the Conference was “Global Mycotoxin Reduction in the Food and Feed chain” and was from 11th to 14th September 2017, Ghent, in Belgium.The conference lasted 3 days; it consisted of 62 oral presentations and 102 posters that were exposed during the whole conference. In total there were 248 participants from 44 different countries, representing all continents. Conference topics were open for all contributions related to the following topics in mycotoxin research: Global impact of mycotoxins; Biodiversity and toxigenic fungi monitoring; Mycotoxin analytical challenges; Prevention; Animal health and toxicology; Impact of climate change; Challenges for developing countries; Remediation and intervention; Human health and toxicology; Modelling & ICT solutions. Different sponsors joined to the conference and they were classified in three different categories: diamond, golden and silver. The scientific committee was formed by 30 researches from 12 different countries (Argentina, Austria, Belgium, Canada, China, Finland, Germany, Italy, Nigeria, Switzerland, The Netherlands and USA) and from 17 different Universities or Research centers. The scientific committee members were experts in different mycotoxin research topics and ensured the quality of the conference. 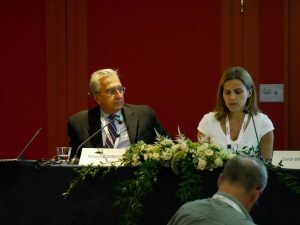 To open the meeting, there was a plenary session called “Global impact of mycotoxins” and the chairs of the meeting were S. De Saeger (Conference chair) and A. Logrieco (MycoKey coordinator). They welcomed all participants and presented the MycoKey project. Following keynote speakers were presenting during this plenary session: J. Feng (State Key Laboratory for Biology of Plant Diseases and Insect Pests, Institute of Plant Protection, Chinese Academy of Agriculture Sciences, Beijing, China), R. Krska (Center for Analytical Chemistry, Department of Agrobiotechnology, University of Natural Resources and Life Sciences, Vienna, Austria), D. Bebber (University of Exeter, UK) and F. Verstraete (EU DG SANCO, Belgium). Biodiversity and toxigenic fungi monitoring: 8 oral presentations; Chairs: A. Moretti, J. Cary. Mycotoxin analytical challenges: 8 oral presentations; Chairs: Y-C Liao and G. De Middeleer. Animal health: 4 oral presentations; Chairs: S. Okoth and G. Avantaggiato. Mycotoxin biosynthesis: 4 oral presentations; Chairs: R. Proctor and K. Audenaert. Human health and toxicology: 4 oral presentations; Chairs: R. Krska and M. De Boevre. Food and feed processing: 4 oral presentations; Chairs: A. Laitila and G. Antonissen. Remediation and intervention: 5 oral presentations; Chairs: S. Croubels and S. Chulze. Modelling and ICT solutions: 6 oral presentations; Chairs: P. Battilani and T. Van der Lee. Developing countries: 5 oral presentations; Chairs. P. Njobeh and F. Stepman. During the closing session, F. Stepman proposed some “hot” topics while conference attendees shared their opinions through group discussions. Finally, A. Logrieco did the closing remarks and he commented the high level of the poster and oral presentations. A. Logrieco and S. De Saeger gave the awards to the best posters to:G. De Middeleer, Ghent University and A.M. Gasperini, Cranfield University. Moreover, The Toxins journal, which is an open access journal of toxicology published monthly online by MDPI (IF 3.030 (2016)), was partner of the Mycokey conference, and published the conference abstracts on-line, free of charge. Moreover a special Mycokey conference issue will be published. 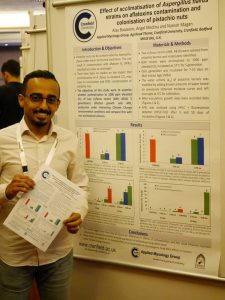 The MycoKey EUROPE International conference “MycoKey: a new approach for mycotoxin management” co-organized by CNR and UGENT in Belgium, was a great success and has evidentciated that MycoKey Project is already a robust referring point for all people dealing with mycotoxins at worldwide level. Moreover, the next MycoKey Conference, the MycoKey EU- CHINA International conference “Integrated solutions for mycotoxin management: the EUCHINA cooperation” will be in the city of Wuhan, Hubei Region, in early September and is under the organization of IPP CAAS, CNR and the Hubei Provincial Academy of Agriculture. The MycoKey Final International conference “Integrated and innovative key actions for mycotoxin management in the food and feed chain” will be organized by CNR in Italy, Bari, in the last months of the Project.